Wallets are one thing men can’t go without. They’re a home for our identification cards, cash, and any other essential we need handy. Available in different designs, sizes, and materials, there’s an option out there for every guy. Whether it’s a slim and sleek modern wallet or an old and faithful bi-fold, it’s one accessory that men inherently pick up on their way out the door. Modern wallets have become such a necessity that many people take them for granted. The wallets we know today have evolved from simple designs that started centuries ago. 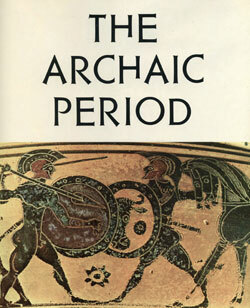 The basic idea of having an accessory to carry important items and currency dates back to ancient times. The staple has grown and developed with every generation. As the needs of man have changed, so has the wallet. 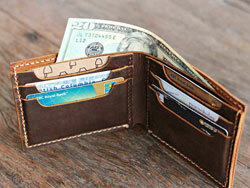 Wallets continue to see vast improvements in design to be more suitable for the modern man. Today, there’s a number of different styles that men can choose from. They all differ in their fundamental design and have their own unique features that set them apart. With the plentiful choices available, men can choose a wallet based on their needs and lifestyle. 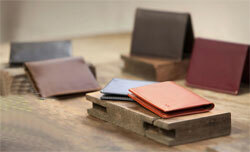 Also referred to as a billfold, these wallets are one of the most commonly used in the world. Simple in design, they contain the main pocket for paper currency and numerous slots to store cards. Some designs also include additional ways to store photos, important documents, and even loose coins. The name bi-fold comes from the basic design. It folds down the middle once over, folding paper currency in half. Bi-folds are predominantly made from leather. This material adds durability while providing a sleek and masculine look. Other synthetic materials are also popular and provide added protection from the elements and theft. Because of their versatility and storage capabilities, bi-folds have become somewhat notorious for being overstuffed. It’s not uncommon for these classic wallets to become a haven for random items. 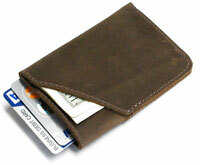 Usually stored in the back pocket, thick bi-fold wallets are quite prominent and vulnerable to theft. However, men can avoid this issue with careful organization and regular emptying. This modern wallet has humble beginnings that date back to the late 1600s. Shortly after the introduction of paper currency in 1690, a basic version of the bifold was created and contained only a small pocket for identification in addition to the main currency pocket. This was refined in the 1950s after credit cards were popularized. This version is the one most men are familiar with. It contains numerous card slots on either side. Since its infancy, it has become a standard across the world. 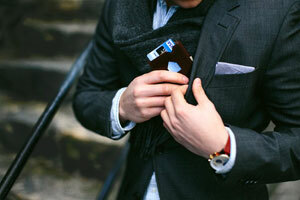 Made to cut down bulk, credit card holders are one of the sleekest options for men today. They are very simple in design and contain only enough space for a handful of cards. 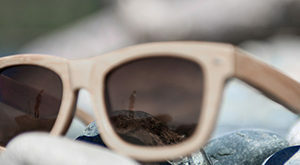 Small and thin in size, they can fit just about anywhere. 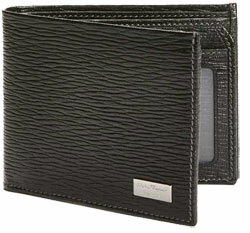 In fact, it’s not uncommon for many bi-fold wallets to contain a separate credit card holder inside. This provides men with versatility on what they can carry. Typically made from leather, they are about the same size dimensions as a credit card and contain no room for loose cash whatsoever. 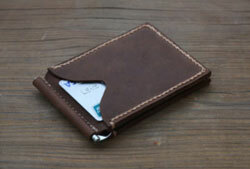 One of the more popular designs of these wallets is to have a single pocket with multiple card slots on either side. This creates enough room to carry an identification card and a couple credit cards. Another popular design is referred to as a band wallet or sandwich wallet. It contains two pieces of heavy material, usually plastic or metal. They are held together by a thick elastic band. The cards fit between these rigid pieces and stay secure. Many men prefer this option over standard credit card holders because the amount of cards it holds is adaptable. Credit card holders were created not long after the modern bi-fold. However, they didn’t gain the same popularity until the last couple of decades. Modern banking technology has changed drastically and more men are opting to spend with plastic rather than paper. With nearly every retailer having the capability of accepting cards, men can avoid paper currency altogether. In that case, a credit card holder is available to keep things organized. 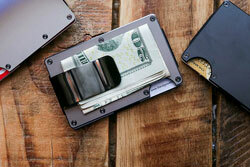 The complete opposite of credit card holders, money clips are made for men that like to stick to cash. In terms of design, money clips are essentially fasteners. They are small pieces of pliable metal or plastic that keep a wad of money together. With that being said, there are numerous ways to construct a money clip. Some include hinges and springs to increase the capacity without sacrificing security. The main purpose of a money clip is to keep cash organized. It helps avoid having any loose paper in the pocket and helps prevent the bulk that comes with a standard bi-fold. The main downside to money clips is that they don’t offer the same amount of protection as an enclosed wallet. The cash is out in the open. The paper currency can become damaged or disheveled in the pocket if not properly secured. 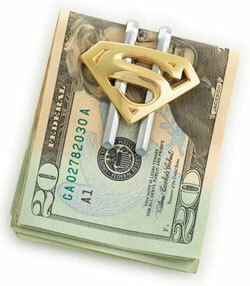 Money clips are often seen as a sign of wealth and style. Because of this, men have a ton of options when it comes to the look of their clip. They can be made from high-quality metals and feature custom monogramming or a flashy design for an added touch of opulence. These devices were used throughout history. In fact, many believe that pharaohs used money clips made of gold and adorned with precious jewels in ancient Egypt. Paper money was used at that time, so it’s a believed that wealthy citizens used some variant of the money clip. Modern options became popularized around the same time as bi-folds. They are a lighter alternative that is still used by many men today. 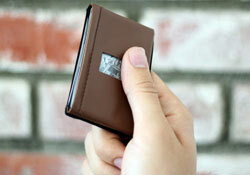 Minimalist wallets combine the best features of money clips and credit card holders into something new. It’s a union that works for the men that fall in the middle of the two extremes. They are rapidly growing in popularity today due to the constant need of scaling back. Furthermore, advancements in contactless payments allow men to make a purchase without taking out their card at all. The design is very versatile and can vary dramatically between brands. However, the basic principle is to eliminate bulk and allow men to carry only the bare essentials. Most are small in size and have only enough room to carry identification and a couple cards. It’s also common to see a simple money clip or band that holds a small amount of extra cash. They can be made from a variety of different materials from metal to leather and fit very nicely in the front pocket. There’s been an influx of minimalist wallets in recent years. This is due to the fast decline of paper currency use and the rise in new forms of payment. It’s becoming increasingly common to utilize wireless payment methods through NFC or RFID technology, essentially eliminating the need for bulky wallets. Similar in idea to minimalist options, cell phone case wallets cut down bulk by attaching a cash and card storage method to another essential item. When men leave the house, it’s always a trio of items they grab: the wallet, cell phone, and keys. By coupling the wallet and cell phone, there’s less to keep track of and less to carry around. 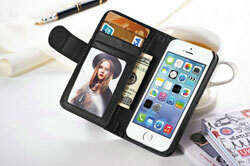 Available for a variety of phones, these wallets attach like a normal cell phone case. They’re typically made of hard plastic or silicone to retain the case’s protective qualities. Some feature a simple pocket for cards while others have hinged openings. Either way, these wallets drastically limits what a man can carry. This is great for those that only want to carry essentials. These wallets are relatively new and have only just begun to gain traction. While they did exist, there weren’t too many options for older flip phones. They’re predominantly made for sleek and slim smartphones. The wallet portion is typically located on the back of the case, though there are some variants that imitate the functionality of a very slim bi-fold. Wallets have appeared throughout history as far back as the Archaic period, though their appearance and use were quite different. Back then, wallets resembled a small knapsack. Made from a leather hide, these small sacks were made for carrying everything imaginable, including food. They had drawstrings to keep things secure and were usually attached to belts. Their design would be refined continually throughout history, eventually being made from fabric and having an expanded use. Many would use their knapsack wallets as somewhat of a lunch bag, eventually gaining a less-than-desirable reputation in Ancient Greece. The term “wallet” dates back to this time as well. During the renaissance period, wallets became more than a necessity. They were made from leather and held coins. In some cultures, they became a symbol of health. However, in others, the act of carrying around items on the belt wasn’t particularly popular. It wasn’t until the 1950’s that wallets became widespread. This was not long after the introduction of credit cards. During this time, manufacturers came up with a bevy of advances that improved the functionality of wallets. This includes the utilization of velcro and zippers to keep money secure in the 1970s. At this time, most men didn’t own a credit card. If they did, it was only one. However, men took notice of the main cash wallet and the accessory took off. From that point, wallets didn’t see a huge jump in design. Small changes were made here and there by some manufacturers, but the fundamental bi-fold remained unchanged. The first major redesign of the wallet came in the 1990’s with the All-Ett. Essentially, it’s a simple bi-fold made from a thin fabric like nylon. It cut the thickness down by about half. Other designs also became popular, such as the checkbook wallet and tri-fold. Checkbook wallets are considerably larger than standard bi-folds and hold large documents like checkbooks and passports. Because of this, they became popular for travel. Tri-fold wallets were an extension of the standard design to give guys more storage room. They have three main sections. Two of those sections fold into the center. With a traditional cash pocket and extra card slots, these are much bulkier than a bi-fold. With the advancement of banking technology, fewer men are focused on cash. Cards are predominantly used for shopping and banking, thus calling for a new take on the traditional wallet. Simple wallets are quickly becoming the norm. Whether it’s a money clip, a credit card holder, or minimalist wallet, the aim is to keep things light and avoid having to carry any unnecessary bulk. Wireless technology, though advanced and beneficial, has paved the way for clever thieves. RFID is used to make secure payments without having to swipe. Radio-frequency identification payment technology was first adopted in the late 1990s but has since become widespread all across the world. Unfortunately, thieves can easily gain access to sensitive banking information and even steal a person’s identity by simply passing over the card. RFID skimming is a modern form of pickpocketing that’s virtually undetectable. All a thief has to do is get close. Shortly after the technology became popularized, manufacturers began offering RFID-protected wallets. These wallets have fine mesh made of either copper or steel woven into the fabric of the wallet. This creates an electromagnetic shield around the card. Essentially, they block the signal of any would-be thieves and prevent access to valuable information. The purpose of wallets has changed drastically since early man. Even in recent history, wallets have evolved from a cash-carrying necessity to one that merely holds cards. As technology and banking needs change, wallets will adapt. Regardless of how they develop, it’s safe to say that men will always carry their wallets. Wedge Sole vs Heel Work Boots, What is the Difference? The Various Types of Work Boots, Which one Suits your Job?